Are your dogs ready for Halloween? Ours are! Well, at least The Grump is. He now has his Spider costume and a Dragon. Both great costumes available at PetSmart. Product received for review. Post contains affiliate links. We originally received the Yoda costume for review, but it was way too big. Sizing up The Grump is quite difficult. Although he is tiny, he’s really long. Since Yoda was only available online, I had to choose something else from the store. They only had a Dragon left in size small. Turns out he could have used a medium in this one, but we still got it on him! Lesson learned not to wait until the last minute with our dog Halloween costumes. Be sure to plan ahead so you get the costume you want for your pets. Putting costumes on this little squirm-ball is not easy either! You think he would be used to it by now, but he is not. Getting good pics is even more difficult. I should just stick to a superhero cape the way he zooms around the house. I never force my animals to wear clothes, so if he protests too much, the costume stays off. However, once he gets it on, he gets super playful. Also, never leave pets unattended while wearing costumes. Maybe I am paranoid, but I worry about them getting tangled up. This little costume is adorable. It’s another one from the Martha Stewart Pets line and such great quality. I was actually shocked at the price, too. Very affordable! ==> See Hilo in his great white shark costume. It’s not too late to grab a costume for your dogs! Head to PetSmart ASAP. They are all on sale now, too! 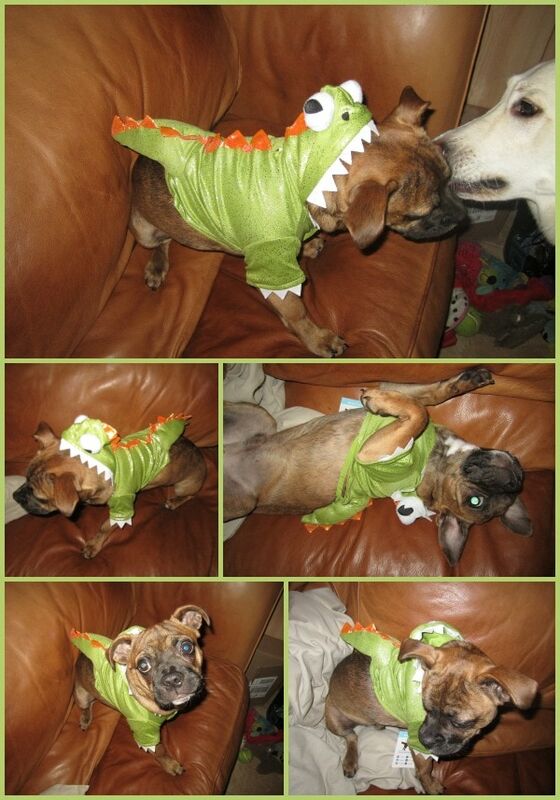 Are you dressing up your pet(s)? If so, as what? How adorable are these costumes. Love them! Yoda is so cute as a dragon! I didn’t get costumes for the dogs this year. I think the cutest was when my bichon went as spider man. OMG!! Adorable!! We have a tux for our dog! LOL, I love petSmart costumes! They’re always so adorable! WHAT a Cutie!!!!! Hehehehe cute costume!